The hip, small-time boutique publishing label Electronic Arts revealed its "Indie Bundle" yesterday—curiously for sale over Steam and not Origin, and there was a passionate response from many observers of the video game artistic community. Including Markus "Notch" Persson, better known as the creator of uber-indie hit Minecraft. "EA releases an 'indie bundle'? That's not how that works, EA," he tweeted yesterday. "Stop attempting to ruin everything, you bunch of cynical bastards." Not only that, Persson says he doesn't consider his operation to be "indie" anymore, meaning he focuses more on the spirit of the term and not its literal meaning, which is good. 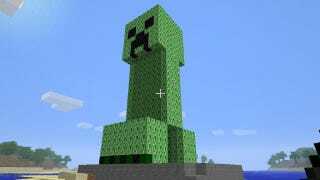 Minecraft is about to release on Xbox 360, published by that art-house Microsoft. "Fwiw, I don't even call Mojang inde any more," he said. "Vlambeer is indie. Polytron is indie. Stephen, Ed, Terry, Derek, Tommy and Chris are indie. "Indies are saving gaming. EA is methodically destroying it," Notch concluded. That settles it!